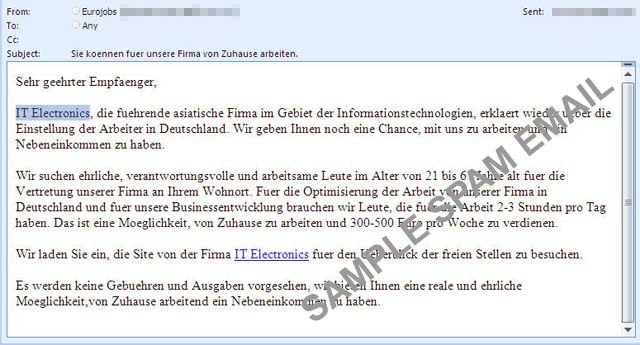 These days, German users receive emails announcing that a company called IT-Electronics is looking for professionals in search of extra income. IT Electronics, the leading Asian firm in the field of information technology, announces again its intention to employ workers in Germany. We give you another chance to work with us and to have extra income. We are looking for honest, responsible and industrious people aged 21 to 67 years old for the representation of our company at your region. To optimize our company’s work in Germany and for the improvement of our business development, we need people who can afford 2-3 hours per day. This is an opportunity to work from home and to earn 300-500 € (Euro) per week. We invite you to the visit IT-Electronics web site to overview our job vacancy. There are no fees and expenses required, we offer a real and honest opportunity to work from home for an extra income. 1. Our client (which might be located in your region) informs us about his desire to enter a supply contract. 2. We give our customers your contact data and he transfers funds directly to your bank account. You must tell us when the funds are received. 3. In the same or in the next day, we proceed with the shipment of our production to the customer. 4. You’ll get instructions, how these funds may be transfered to our bank account. We pay you a percentage of each transaction. Typical amount is 5-7% of the funds received in your bank account. You will receive this commission immediately, after the customer’s payment is received by us. We will also cover all cost associated with the money transfer. The job aspirant only needs a phone and a bank account, using the phone to arrange money transfer with potential customers of IT-Electronics, and the bank account to facilitate the money transfer to IT-Electronics. Analysis reveals that the emails were sent by accounts located in Columbia, Mexico, US, Germany – most probably by botnet-zombies. The IT-Electronics website is hosted in China, which is quite infamous for hosting rogue sites. Well in case you’re interested in taking the job, here is one important fact that they didn’t put in the job description: money laundering is illegal.